Thomson Reuters was pleased to host the 2013 Criminal Law Journal Board Meeting and Dinner on Friday 3 May. The Criminal Law Journal was first published in 1977. It features in-depth articles and reviews of criminal issues across all Australian jurisdictions. Consideration is given to law reform issues, comments on High Court and State criminal cases, relevant legislation, a digest of recent criminal cases, book reviews and reports of developments in criminal law in Australia and overseas. The meeting was an opportunity to exchange ideas on the future of the Journal, and on the state of criminal justice and procedure around Australia generally. The meeting was chaired by the Hon Michael Kirby AC CMG, Chairman of the Editorial Board and included a report from General Editors Stephen Odgers SC and Professor Mirko Bagaric. Other board members in attendance included Robert Bromwich, CDPP; Matthew Goode, A Crim R Editor; and Grant Niemann, International Editor. Joining us by teleconference were Justice Mark Weinberg, Vic Ct of Appeal and Kate Warner, Sentencing Editor. With so many notable legal minds in the room it is hardly surprising that lively discussion was sparked at the meeting and carried on to the dinner which followed! It is exciting to note that submissions to the Journal have been increasing over the past year, with a particular increase in articles dealing with Sentencing issues. The Board also discussed the topics covered by the Journal since the last Board meeting, and the breakdown of contributors (with a healthy number of practitioners submitting articles). From the meeting and from general customer feedback, it is clear that the journal is widely valued and is continuing to meet customer needs. We extend our thanks to the entire Editorial Board for all their efforts, particularly those of the General Editors Stephen Odgers SC and Professor Mirko Bagaric. 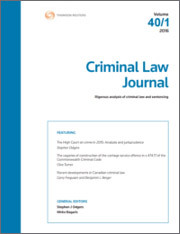 We welcome submissions to the Criminal Law Journal from practitioners, academics and Criminal Law specialists. For more information visit Journals Talk or email lta.crimlj@thomsonreuters.com.